We all have bad habits. Habits that we’ve had for years that we’re trying to kick. Mine is waking up in the morning and immediately checking my phone. I decided I explore the problem of habit building / rebuilding. A habit basically happens when a conscious decision to do something becomes an automatic behavior. 40% of actions people perform each day aren’t actual decisions, but habits. First there is a cue, a trigger that tells your brain to go into auto pilot, or habit mode. Then there is the routine, which is the act itself. Finally, there is a reward, which helps your brain figure out if this particular loops is worth remembering for the future. Overtime, this loop becomes more and more automatic. And eventually, a habit is formed. 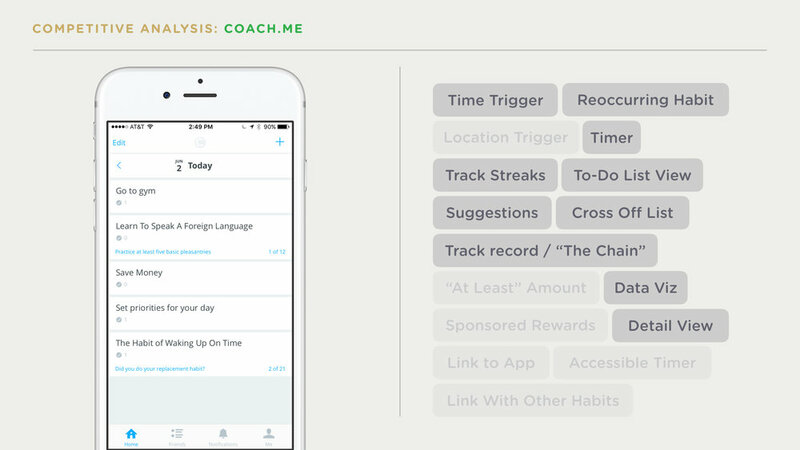 My initial plan was to directly turn the habit loop and strategies into features for the app. But first, I researched my potential competitors. 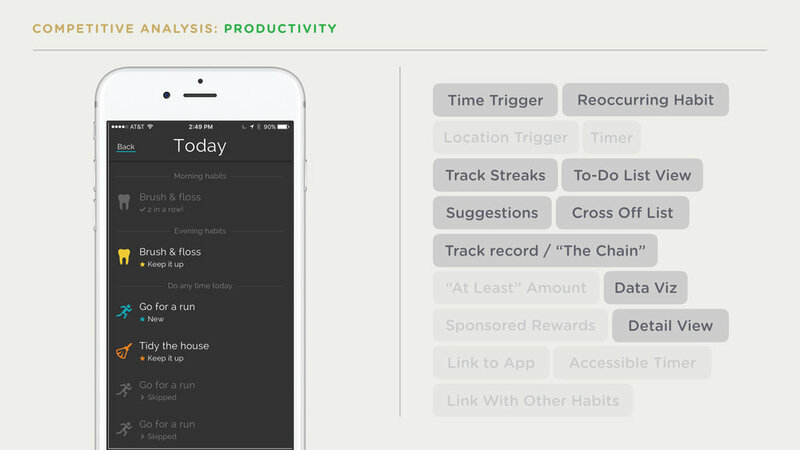 First iteration was just about packing all these features into the app. I then rapid-prototyped some possible user flows based on the features I came up with. So I went back to the app and brainstormed some social features — to make the app into something that’s a little more about challenges between friends. And bring some of that competitiveness and social pressure into habit building. I then updated the user flow to what became the MDP (Minimum Desirable Product). MDP preview: Loading screen (left), "Add a challenge" screen (middle), and Home screen (right). Next steps are to further test this prototype with potential users. Please stay tuned!